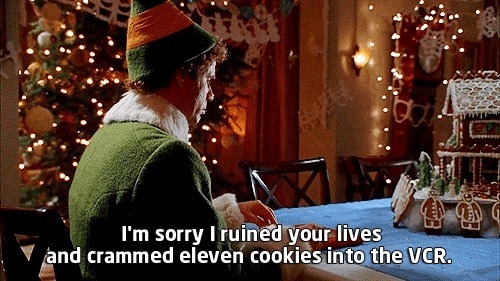 Elf quotes,a 2003 film,enjoy our best quotes from this movie. So what are you doing here? Did Gimbel's give you your job back? No. But things worked out pretty good. They gave me a restraining order. Buddy: SANTA! OH MY GOD! SANTA'S COMING! I KNOW HIM! I KNOW HIM! Buddy: First we'll make snow angels for a two hours, then we'll go ice skating, then we'll eat a whole roll of Tollhouse Cookiedough as fast as we can, and then we'll snuggle. Buddy: I just like to smile! Smiling's my favorite. Ow! Son of a Nutcracker! Looks like a christmas tree! Buddy: [to Jovi] I think you're really beautiful and I feel really warm when I'm around you and my tongue swells up. Buddy: So… do you wanna eat food? We elves try to stick to the four main food groups: candy, candy canes, candy corns and syrup. There's no singing in the North Pole. Buddy: You stink. You smell like beef and cheese! You don't smell like Santa.